Working out the muscles of your neck and lower facial regions will help you get a tighter neck. Stretch your body on the bed and let your head suspend at its edge. Now, make use of your neck to lift your head up towards your torso and push it back down slowly. Do it minimum 5 times a day. Keep one of your hands on your temple and press your head against it. Make sure that your head does not move forward. Wait for 10 seconds. After that, change the position of your hand and place it right behind your head. Repeat the same technique for another 10 seconds. Bend your head toward the rear by sitting erect on a chair. Once your eyes reach the ceiling of the room, move your mouth like you are chewing something by keeping the lips closed. Hold the position and repeat for 10 to 20 times daily. Open your mouth as much as you can. Lift up the chin at the same time. Wait for 30 seconds or so and then repeat. Applying homemade facial masks in upward strokes can make the sagging skin of your neck firmer. Reduce a medium-sized ripe banana to pulp and prepare a skin-tightening banana mask by blending 2 teaspoons of sugar and 1 teaspoon of crushed alum with it. Spread the paste over your saggy skin evenly. Wash off with lukewarm water after 10 to 20 minutes. You can also prepare a mask by mixing 3 tablespoons of milk, 1 tablespoon of honey and a few drops of vitamin E oil. Apply it to your flabby neck skin and rinse away with warm water after 20 to 25 minutes. 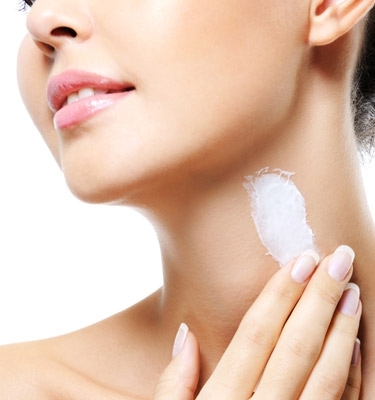 Using a good quality skin-tightening product regularly can help us get rid of saggy neck. Moisturizers are known to induce enough moisture into our skin thereby making it healthy, plump and wrinkle-free. Choose a daily moisturizer that is light on your skin and contains plant extracts in order to maintain the elasticity of your skin. Night creams are capable of rejuvenating our skin by restoring its natural oil balance. Opt for a high-quality night cream that is rich in natural ingredients and repair your sagging neck skin. 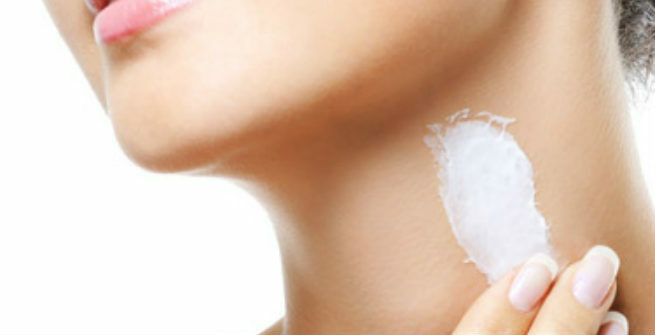 Anti-ageing products are also extremely helpful in firming the baggy skin on our neck. Being loaded with skin-tightening natural components, they can boost the collagen production within our skin cells and tighten up the skin effectively. If nothing works for you, consider a surgical or non-surgical medicinal treatment for eliminating the sagging neck. There are non-surgical medicinal treatments, such as Ulthera and Fractionated Resurfacing that can help you repair the flabby skin of your neck successfully. Regular Liposuction or Ultrasound-Assisted Liposuction is considered as the most beneficial surgical cure for sagging neck.